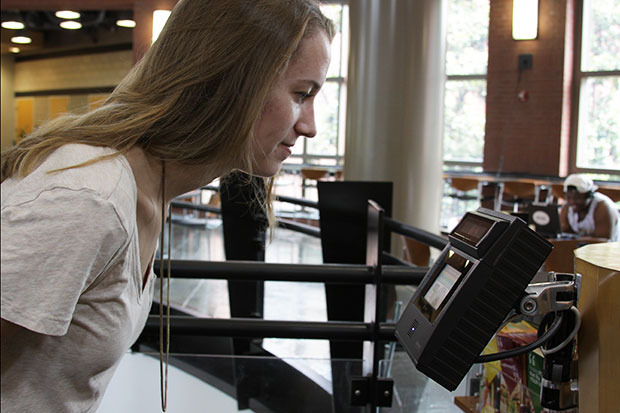 Maryland Dining Services has deployed ten MorphoWave biometric readers across campus. The university opted for the MorphoWave Tower units that stand on their own at roughly waist height. The university’s smallest dining hall can get away with having just two MorphoWave towers connected to two turnstile lanes. The next largest has three towers and three lanes, with the largest hall having four. These are important considerations because, as Ming admits, the deployment wasn’t without it’s nervy moments. Despite the undeniable “cool” factor and the admiration that an advanced, tech solution garners from the contemporary student, one fact remains: it has to get the job done. And in that respect, the biometric solution passes the test for Maryland. After the initial deployment in Maryland’s dining halls, the Department of Intercollegiate Athletics has asked for MorphoWave towers in the existing training table facility, which Dining Services operates, Ming says. There are now plans to add an additional MorphoWave tower at a new athletics facility, currently under construction, which will include a dining area. So what about that “cool” factor? From the first time students returned to campus and were greeted by the new biometric system, Ming recalls it being an instant hit. In a recent survey conducted internally by CBORD, 48% of the universities polled indicated they already have plans to implement or expand the use of biometrics on campus. It’s a figure that doesn’t exactly surprise CBORD or Urban. Coinciding with this article is an informative, FREE webinar hosted by CBORD that discusses in greater detail Maryland’s use of the MorphoWave product. Webinar attendees will hear from both Fuller Ming and Wesley Urban about the deployment. The webinar is scheduled for Wednesday, January 30 from 2:00–3:00 p.m. EST. Register here.